Ooops...with all my excitement about becoming a Thirty-One consultant, I almost forgot to post the SOTM for February. Well, at least I got it done...even if it is on the last day of the month! 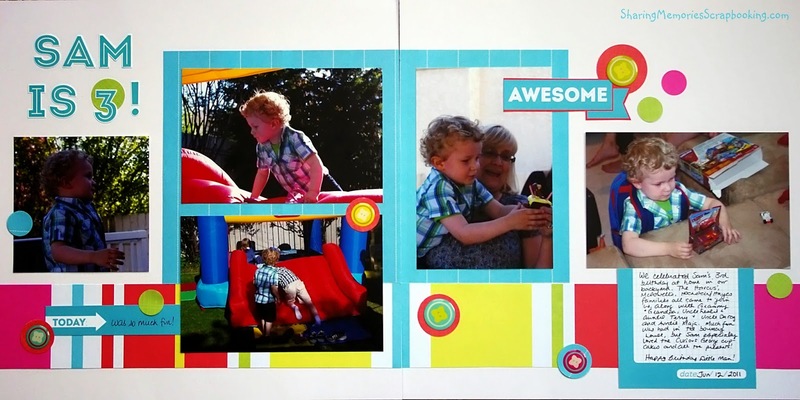 A couple of weeks ago I was doing some pages in Sam's album and came across photos of his third birthday. Since his birthday is in June, we usually have good weather and do an outside play party. That year we put up the bouncy house and had everyone over for a family barbeque. Curious George cupcakes, special birthday presents and beautiful sunshine for my boy made it a grand time! 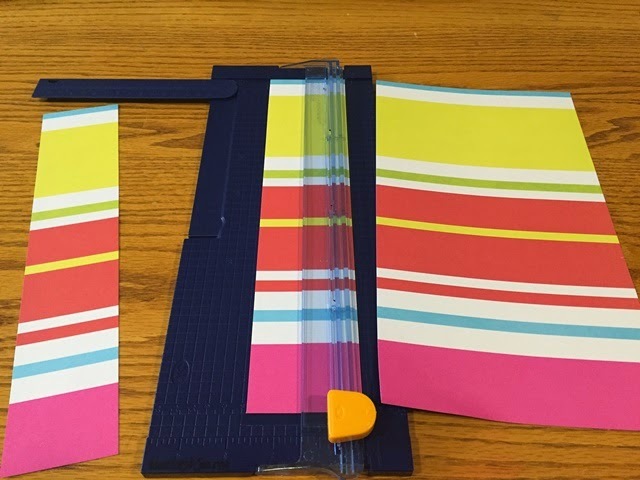 Keeping my 1-2-3 formula in mind - 1 piece double-sided paper, 2 pieces cardstock and 3 cuts - I chose a bright, happy, double-sided paper from an old Creative Memories power palette called "Candy Shoppe". The bold stripes echoed all the colors in the photos and the more subtle blue and white stripes on the opposite side were a great backdrop for the photos. I used two sheets of white cardstock as the base and I had letter stickers and some epoxy embellishments from the Candy Shoppe kit to complete the layout. 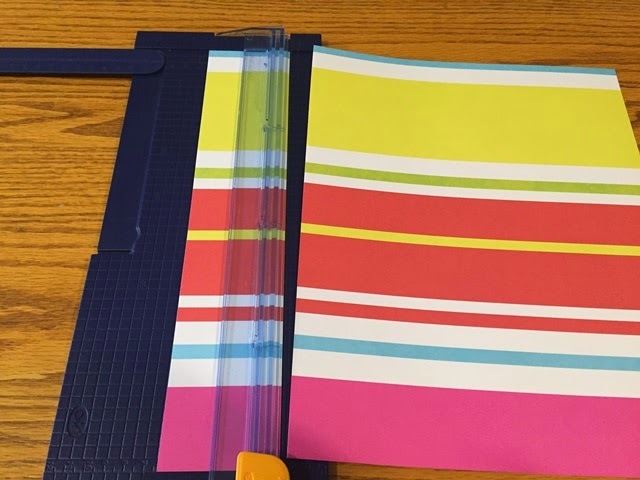 Cut #1 is made at 2.5 inches to create a 2.5" x 12" strip. This is Piece A. 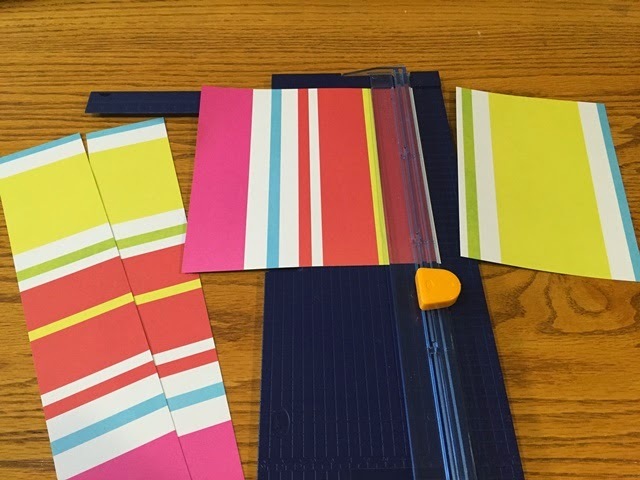 Tip: When you are using a striped piece of paper, you probably want to see all the colors in the stripes, so make sure you cut across the stripes in this situation. Cut #2 is made at 5 inches, creating another 2.5" x 12" strip - this is Piece B. 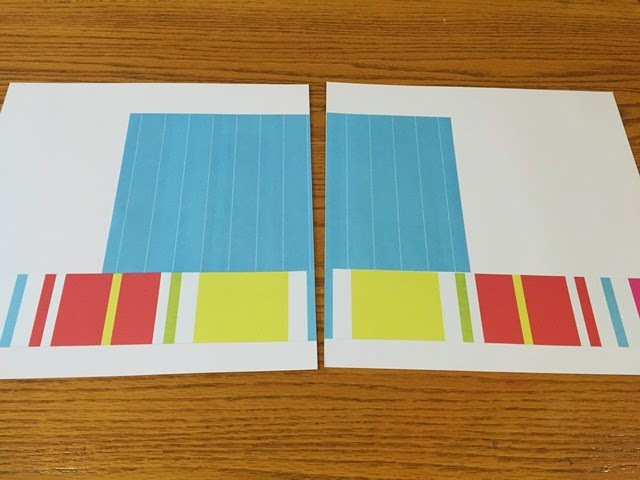 Make cut #3 by turning the remaining piece and cutting at 7" to give you a 7" x 7" piece (Piece C) and a 5" x 7" piece (Piece D). Now, assemble the layout. First place pieces A and B across the lower part of each of the cardstock pages as shown (about an inch up from the bottom edge) to form a continuous border across the layout. Next add pieces C and D just above the border with their edges touching the sides of the cardstock bases that meet in the middle of the layout. 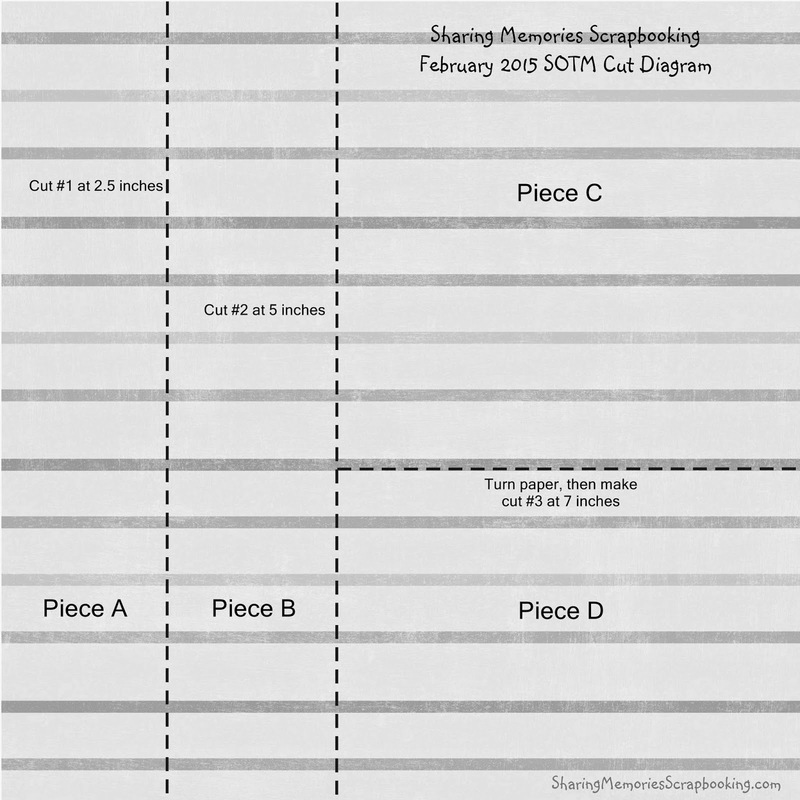 Place your photos. 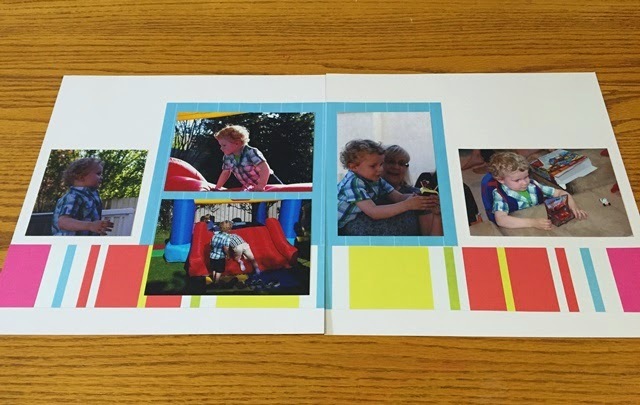 I used three horizontal 4" x 6" photos, one vertical 4" x 6 photo, and trimmed another horizontal photo into a 4" x 4" square. 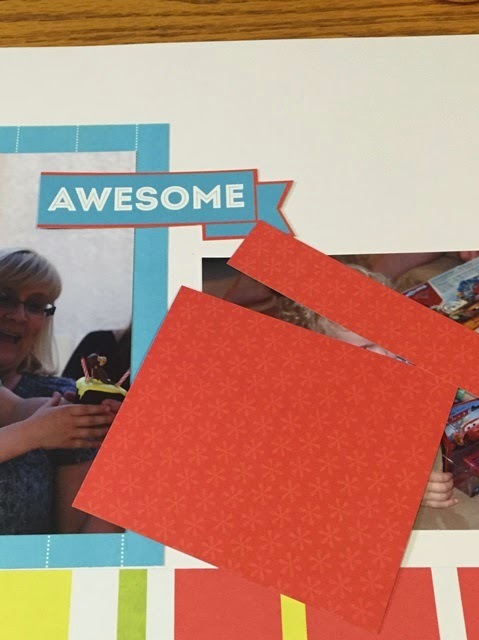 This was super quick and easy to put together - about two minutes to cut and place the paper strips and another couple of minutes to trim and place the photos! Now you can embellish any way you like. I knew I would use the letter stickers for the title, and I initially thought that maybe I would write my journaling about the photo as shown on my sketch. 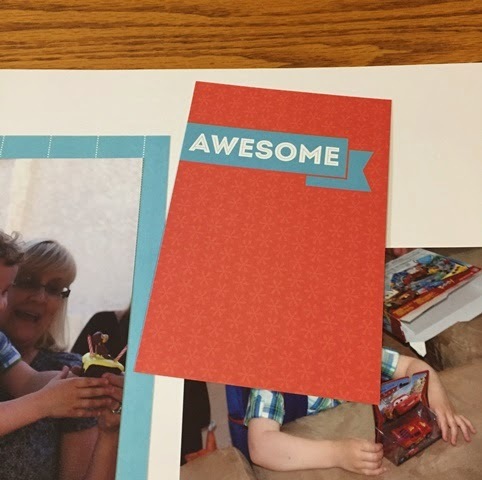 But then I found a 4 x 6 filler card in the Candy Shoppe kit that said "Awesome" that I wanted to incorporate somehow into the layout. I decide to trim out the word and pennant. After, I was left with two other pieces from the card. When I turned them over, I found that on the back side of the scraps there was another sentiment and part of a journaling box that I decided to use instead! How lucky! 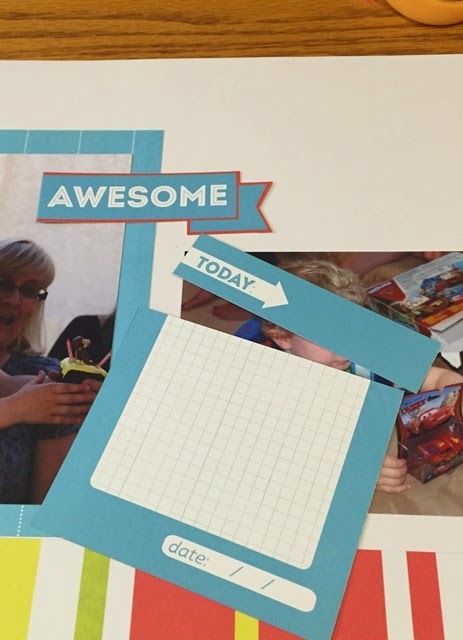 I adhered the "Awesome" pennant, the "Today" strip and the journal block and then added the title stickers above the 4" x 4" photo. 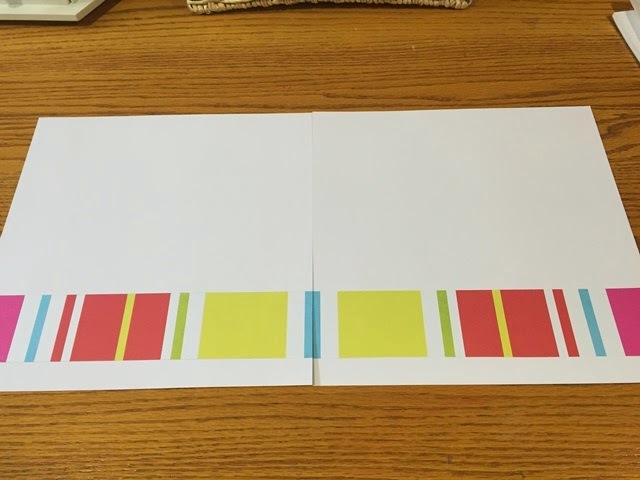 Once I completed the journaling, I realized there were so many straight lines that I wanted to add some circles to break up all the edges and add some softness and variety. I used some scraps from other papers in Candy Shoppe kit and punched out various sizes of circles to dot across the layout. I finished a few of the circles off with the epoxy stickers shown in the materials photo at the beginning of this post. And in only about 15 minutes! 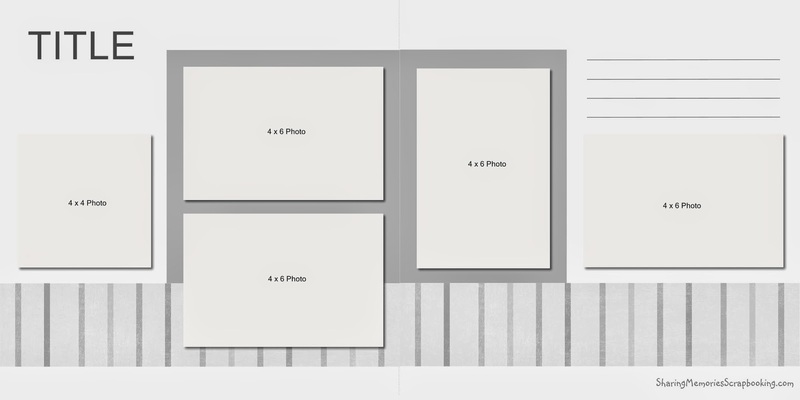 I guess the reason the final layout comes together so quickly is that I spend the majority of the time planning it out in advance - and I truly enjoy the process of figuring out new ways to cut a 12 x 12 sheet of paper and use it in a different layout. 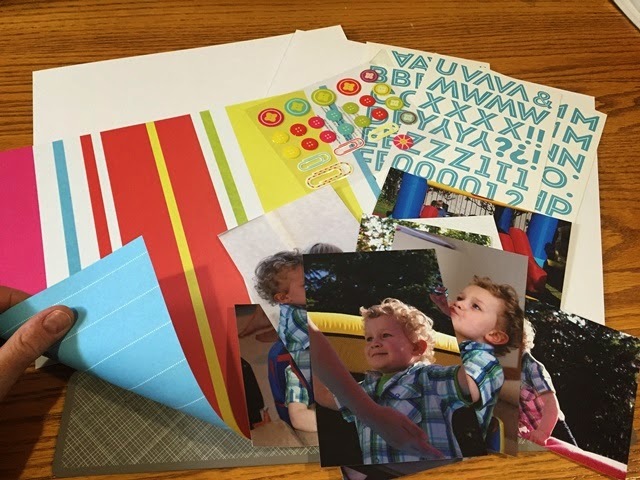 So, when you use these 1-2-3 layouts, YOU can benefit from MY planning - just choose your photos and paper then follow the steps for a quick, foolproof scrapbook layout! I hope you give this layout a try this weekend - if you do, I'd love to see it. Simply leave a link to it in the comments below.